Last week we asked about the sometimes prickly subject of copyright and how your church handles it. The majority of you, 43%, have someone on staff who makes sure copyrights are covered and no one’s stealing or getting in trouble. Good for you. Another 12% are super careful and consult lawyers and the what not. That’s great, but it only amounts to 55% who are making sure they’re legal. Almost a third (29%) are just going with their gut and hoping they don’t get sued. Yikes. Is this just the easiest path to take? Do you not know where to go for help (Hint: The Church Marketing Lab is a great place to ask questions)? 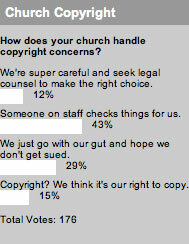 Finally, 15% think it’s the church’s right to copy. Talk about prickly. I know there’s a whole open source, anti-copyright movement, but this doesn’t seem like an approach that has much integrity for churches. I realize others may have an attitude that if it’s for ministry it’s open game. Again, you’re lacking in the integrity department. If you don’t like copyright, stick to public domain or the appropriate Creative Commons material. This week we’re asking about taking your church web site mobile. I should point out that the whole ‘open source’ movement isn’t necessarily against copyright, and it certainly isn’t about law breaking. It’s about making copyright law fair and preventing our culture’s intellectual capital from being locked up and unusable for insanely long periods of time. Sure, there are some who are just cheap and lacking in integrity. That doesn’t mean we should just stop sharing. As a professional graphic designer (and one who does a lot of work for churches) I cringed at the 15% that felt it’s the church’s right to copy. I spend hours, days, sometimes even weeks and months on my creative work, which U.S. law defines as intellectual property. Time has a value and my work deserves a price. The same can be said for musicians, artists, writers and the many other creatives that produce work used by churches. How sad that a church, of all places, feels it has a right to take from someone else. Do such churches feel exempt from all laws or just copyright laws? Do they also pick and choose which of God’s 10 Commandments they wish to obey? Oh, that’s right. Stealing is one of those commandments. And that’s what a disregard to copyright law is. It’s stealing. So, how come the poll did not ask about using CC or PD material? I’d have thought many people would vote for where possible we use CC or PD images as the default, then add one of the above for when this fails. Are you guys going to do an updated poll on this subject anytime soon? I’d be interested to see if perceptions have changed after so much discussion on this subject over the past few years. Chris, since you found our poll on copyright from eight months ago, I doubt we’ll be running another one so soon. But we’ll keep it in mind. Thanks.